JUSTIN GROUNDS // Nomadic multi-instrumentalist and electro-acoustic visionary" Justin Grounds released his stunning new album 'The Dissolving' last March. Grounds' own life has trodden a path as wildly romantic and unconventional as his music. ... Born into a family of intellectuals, priests and hippies, his musical education was unorthadox and eclectic; studying baroque violin, foraging ideas from classical sonatas to jazz/funk grooves, touring with a drum'n'bass collective and completing a degree in electro-accoustic composition. "As my life was drawn into this very organic rhythm, the tides, the fire, the chopping of the wood....in a strange way creatively I started getting drawn into the electronic side of my studio. All the time I was working on this record I was deeply seduced by the idea of combining the sheer purity, almost divine, but cold perfection of the electronic sounds with the fragmented and flawed, yet warm wooden sounds of the string instruments. Somewhere in the joining of these two sides of the spectrum came a profound and hopeful movement." Picture is attached. 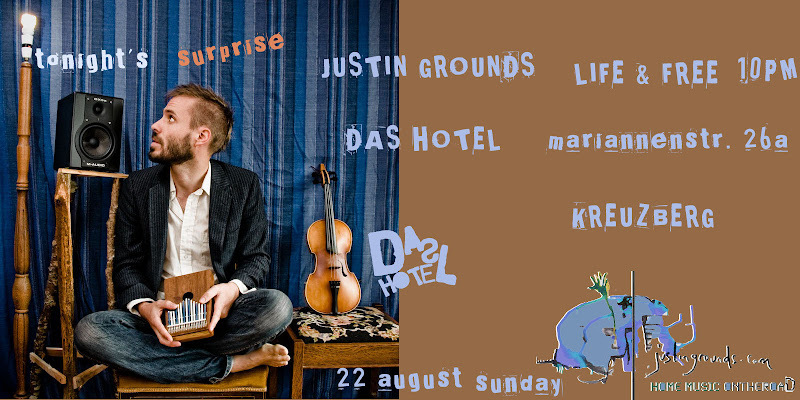 Will put out the word online about the show on Sunday in bar of Das Hotel. Send me anything here to this address. Copyright 2008| Blogger Templates by JealousGUY modified and designed for Das Hotel.